I don’t have a lot of time out here this visit, so there’re no wasted minutes, and people to meet. We started off going to see Miss Alicia, the new tutor. Bex likes her, and yet there was clearly something that was holding her back from wanting to go. I needed to assess the situation and see whether I felt like it could really work. David had been over there and wasn’t clear whether the piles and piles of stuff all over the place was an episode of “Hoarders” waiting to happen, or the honest result of a publicist moving in to a new house in the middle of Pilot Season. At the kitchen table Alicia’s assistant was trying to convert Alicia — who prefers people to technology — to a new computer. Another mother and daughter came in — I think they actually live there. We seized a lull in the activity to sit down to talk. 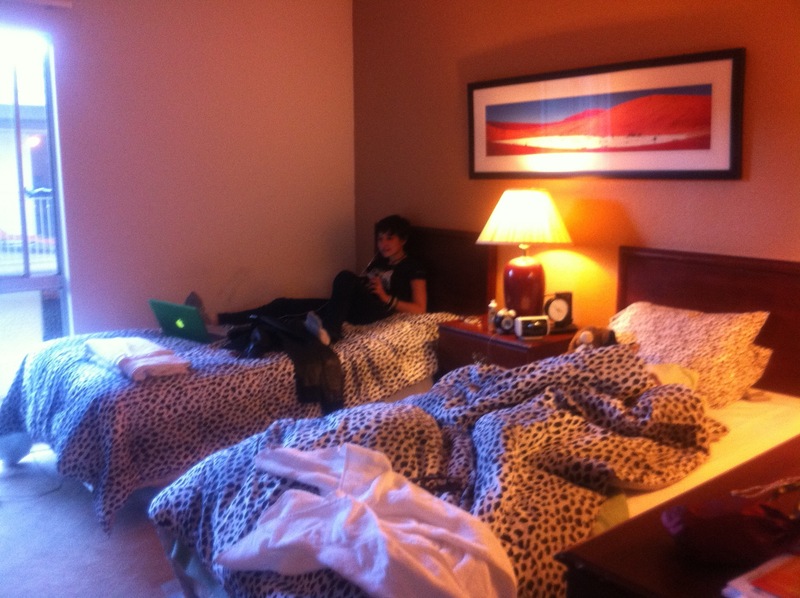 It was clear that it could be a good place for Bex. Alicia gets learning style differences, and life-work balance, the need to take breaks and run around, that some people actually need noise to concentrate, etc. Bex just needed to communicate what she needs without worrying that she was hurting Alicia’s feelings. So I pulled out my coaching tool-box and designed an alliance between Bex and Alicia, which worked well! We left with a clear understanding of what each of them needs from the other, and what they were willing to commit to. Bex has regular hours, communication with Paideia got Alicia the information she needs, and Bex left with clear homework assignments. Confidence is high. Lunch at Hugo’s — I’m like a homing pigeon, I can’t visit LA without at least one trip to Hugo’s. We get home at 4:45 and Bex is off to make arrangements to pay for the broken window with the people from earlier in the week (remember the pine cone?). I get a rather frantic text — yes, frantic reads in texts — to come over now, there is someone you want to meet. I have no clue what she’s talking about — this is Hollywood, so I’m thinking it might be some celebrity or something — and I find myself in a rather dark 2 bedroom apartment that is clearly a “permanent” residence. Apparently, G-d threw the pine cone through the window so that we could meet. Okay, Candy is a big woman, a former US Post Office Police Officer who has lived here with her 2 teen-age daughters for 3 1/2 years. Her husband is still a postal worker back in (I think) Wisconsin. She’s been constantly relying on “G-d to provide room-mates” so she can make it work. She doesn’t have a job any more — she was in a car accident that left her in a coma for six months and so she can’t carry a gun anymore. When they don’t have a room-mate, the husband works lots of over-time, which is hard because he has seizures. They only see each other twice a year. She would be like a second mom to Bex. I get a glimpse of her parenting style as she praises the older teen who is focused with her work, and then criticizes the younger one for not being committed. She even demonstrates for me as she yells at the kid to get off the computer, and then looks back at me with satisfaction, as if to say, “see what an attentive mom I am?” OMG! Back to find David and figure out what we’re doing for the evening. Bex realizes its Karaoke night. We negotiate the math that needs to get done before tomorrow, and she’s outta here. There is, clearly, a lot to talk about. And remember… I’m not a fiction writer. Who needs fiction when the characters are so creative? Another day without a lot of activity – great, actually, for Bex to get started with the semester, though I can tell she’s starting to get antsy. Apparently, during Pilot Season, you can get an audition and the sides, but they may not schedule it for weeks – or they can schedule it the next day! I’m learning that everyone out here has his/her favorite coaches, classes, etc. and there is no shortage of strong opinions. I’m trying to navigate between the agent and the manager, who are working together, but still have their favorites. Sometimes there are delicate decisions to make. And I thought I was out of politics! So I started looking into the classes and coaches, and we’ll see what happens. Bex went to class in the evening, and I went to dinner with my college friend, Bennett, who took me to an authentic Mexican restaurant near Koreatown 😉 It was so nice to hang out and feel relaxed and laugh a lot. Bennett – a brilliant, colorful character with a talent for story-telling – cautioned me about the business with sad tales of Brittany’s handlers and the lengths they’ll go to make a buck at her expense. I’m reminded again of how important it is for Bex to have supervision out here, and to keep grounded and centered. While it’s not an easy task, I do believe that the many challenges that Bex has experienced throughout her life will serve her well in keeping perspective in this crazy world. When we last saw our s/hero, in August 2011, she was reluctantly leaving LA and returning to her beloved family and school in Atlanta. With a top-notch manager and quality agent on her team, she kept busy throughout the Fall, skype-coaching, taping and uploading her auditions. Boundaries between Atlanta and LA agents were clarified. Bex was in business — miserable, but in business. Pining for LA, Forensics class was the only reason she could see to be in Atlanta. Paideia fully supported her and worked with her as best they could (amazing, honestly! ), and we began to prepare for “Pilot Season” and pilot camp, planning for Bex to be in LA with a parade of guardians for 10 weeks. Her trusted tutor, Caroline, carried the brunt of the final weeks of stress, though her siblings definitely ran a close second. 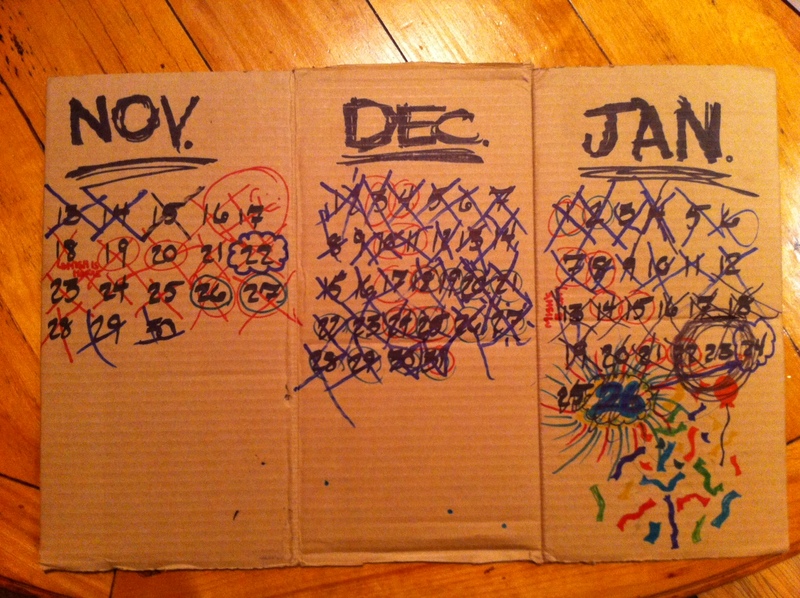 Bex checked off a cardboard chart with the dates scribbled on it, and counted down to January 23. Counting down days like a prisoner awaiting release! There was drama throughout, of course: a call in December requesting Bex for a part on a Disney show if she could be there Jan. 5 (probably); a call on Jan. 3 saying, “oh, by the way, they changed the age on that part to 10-12 and she’s now too old for it.” The planning, the preparations, the threats of cancellation (I confess).